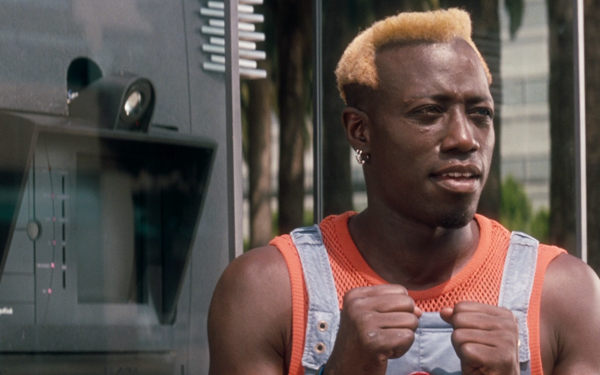 It’s 2036 and it’s a different Los Angeles in Brambilla’s Demolition Man, an entertaining action piece starring Sylvester Stallone and Wesley Snipes. They play John Spartan and Simon Phoenix respectively, and we meet their characters in a crossfire after years of Spartan trying to catch Phoenix. When the incident goes awry, it sends both of them into a cryogenic prison where they would be kept frozen until their respective parole hearings years later. 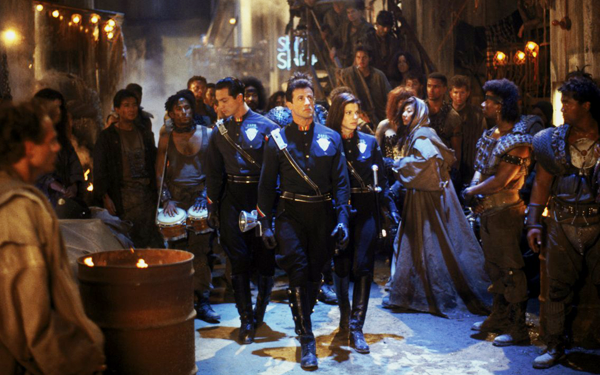 The setting shifts to a futuristic, utopia style LA, which by then was known as San Angeles. The people were heavily versed with technology, and violence wasn't rampant on the city. However, their idyllic world changes when Phoenix is defrosted for his parole hearing and escapes, committing murders in his wake. The police then deduced that defrosting Spartan was their only option to catching the guy. He gets paired up with Lenina Huxley, a budding cop who dreams of having a more adventurous job. The world that the writers envision was on the simple side, and yet interesting; I was curious to know more how their version of the future. There were a lot of rules and customs that were peppered throughout the movie. Most of the world building was centered on the inventor of the cryogenic prison and how he deems the world to be. With his idyllic style of the world, there are bound to be naysayers. While the world building was really good, the character development was not. Both Raymond Cocteau and Edgar Friendly could have had a bigger impact to the narrative of the side story considering the role that they play. The movie mainly focused on Spartan and Phoenix, and it was their interactions that made this really entertaining. I found Wesley Snipes got the end of the stick. While Sylvester Stallone was getting good character time, I thought that Snipes’ character had a lot of plot holes, and he is strongest when he’s acting alone or with Stallone. I wanted his villain to be more memorable. I enjoyed his performance at the first half of the movie, but I think the writers didn’t really know what to do with his character at the latter half, particularly with tying loose ends so his story was riddled with plot holes. Stallone was in his element, but I couldn’t help but think of him channeling some Arnold Schwarzenegger vibes in the latter’s 90's movies. Although that could be accounted by the lack of Stallone movies I have seen that were released in this time period. I thought that Sandra Bullock was a bit awkward, but when I was clear on how the world was, her movements and expressions made sense. Her character’s ease with Stallone’s old cop was complemented by her obsession with the 20th century, a fact that was repeated constantly throughout. I thought that it would be dated, but this was very entertaining. It didn’t skimp on the action scenes, there were funny moments and both Snipes and Stallone brought it. It isn’t top notch filmmaking, but is something that I will watch repeatedly. This is such a fun movie to watch. What you say about Snipes' character is very true, but Wesley was so good he made up for a lot of that. It's certainly one you can watch over and over. I wish I found out that this existed years ago. It would go well with my re-watch of The 6th Day. It really is a fun movie to watch.